Gut Oggau is a biodynamic wine estate in Oggau, Burgenland, Austria owned and operated by Eduard Tscheppe and Stephanie Tscheppe-Eselböck. Edward grew up making wine with his father and Stephanie’s family have a Michelin star restaurant. In 2007 the couple focused their energies into reviving a dilapidated winery, including a 200 year old screw press and abandoned vineyards. Their approach was to farm according to organic and biodynamic principles from the beginning and the results are impressive and their wines have garnered a cult-like following amongst natural wine lovers worldwide. Atanasius is a blend of Zweigelt and Blaufrankisch (known as Kekfrankos in Hungary) vinified in stainless steel with natural yeast to produce a stunning rich yet smooth wine with finesse. 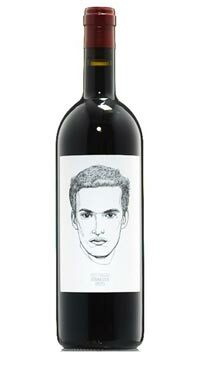 Each Gut Oggau label is a portrait of a fictional family member, Atanasius is a grandchild and a handsome young man who is well liked and very popular, yet “still retains some hidden qualities, which make him even more interesting.” Perhaps the same can be said for the wine in the bottle.